It’s a bus thing...I’m glad we’re on board! Re: POST YOUR BUS PICTURE HERE! Took four years to convert. Traveled 15,000 miles in the first 12 months. inside using the Motor Cabin as a guide & furnishing it with antiques. 1974 Silver Eagle, 3406 Caterpillar with Jakes, Allison HT70, Onan 10KW Quiet Diesel, Aqua-Hot, Cruisair, 10" roof raise, new siding, cafe doors, etc. This is a frame off restoration. Six years and counting to get to this stage. I estimate that I have about 3-4 more years untill it is complete. This is a my MCI 9 work in progress, 8V71, 740 auto. 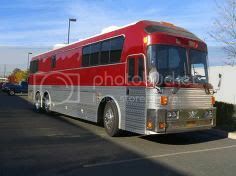 NJT, just got back from florida the bus with only several minor problems almost 4000 miles. Hello all, new member here, and absolutely love the site. we have an 82 tmc and have been working on this conversion for 11 months now. it is definetely a "WORK IN PROGRESS, WITH A LONG WAY TO GO " so much knowledge here and so many great looking busses. here is our big blue highwayrunner. Ok here goes. Not the most recent pictures but the first I found. Thought the periscope was kind of neat. 1964 4106, Frank And Carol Allen , home made 1987 , in dash air, sheppard, 730 ,onan 7 kw gen set, owner designed tilt wheel, power driver seat, lots of work. Another "in-use" shot from our trip tp Savannah this past weekend.